Kickstarter has had both positive and negative stories in the past year, but here's a story that might amaze you and get you excited for the future of gaming. I'd rather have a holodeck, but I'll take it. 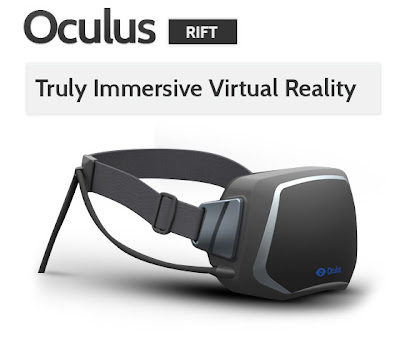 I introduce to you the Oculus Rift, the concept is: a gaming headset that allows you a whole new level of immersion into your game worlds. Mananging to rake in a total of nearly $900,000 in just one day of being up as a Kickstarter - with a lot more money to come in the next 29 days. Cheap. Trying to make it available to all gamers. Immersive and realistic. Special diagonal display at makes it feel as if you're "in" the screen area rather than looking at a screen. Low latency (when you move your head and look around there won't be any delay between the image and your movements). Currently they even have the backing of huge developers such as Valve, id software and Epic games, all excited for this new tech. and the applications it could have in their future games as well as maybe even changing the face of gaming as we know it.